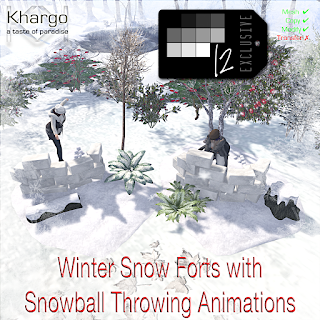 This month for TWE12VE we have made the Winter Snow Forts with Throwing Animations. 2 different snow forts are included along with a winter leaves prim. Rez as many as you need for fun snowball fights with friends! Each snow fort has 9 animations to choose from. Copy/modify and experience enabled. TP to TWE12VE and try out the snow forts on the DEMO PLATFORM.